You must drive to Indiana. tire wear issues and a blown hydraulic piston that moves one of the slides. RV from the clutches of incompetence. Nothing was fixed... Nada.... Zilch. our mid December departure to Arizona so I have formulated a plan B. 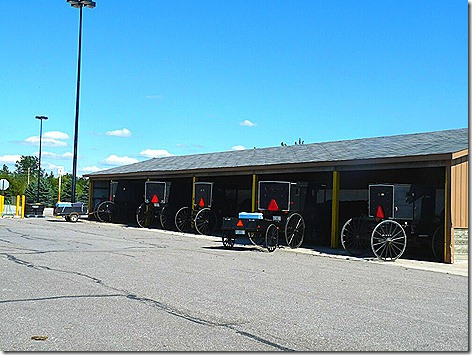 The local Walmart even has a special parking shed for the Amish Buggies. are located in the immediate vicinity as well. Plan B is to drive up to Indiana next Saturday. with disc brakes. My current trailer brakes are not up to the task. that should have been supplied in the first place. both the frame and the slide rooms. They will fix the hydraulic piston. While at MorRyde I will sleep in the RV at night while it's in their shop. breakfast and lunch.... That's service. office if I don't want to work in the trailer while they are working on it. day trip to Ohio (80miles) and back to pick them up while the trailer is being worked on. Weds afternoon hopefully all has come together enough that I will be back on the road to home. Only 32 hrs and 1,700 miles later I should be home. 2 weeks later we head to Arizona for some wintertime desert living.